Punjab Chief Minister Capt Amarinder Singh is leaving for an eight-day visit to the USA and the UK tomorrow to seek projects and assistance from the World Bank (WB) and United Nations (UN) agencies. The Chief Minister told The Tribune here that the state government would seek projects worth about $ 1 billion for Punjab from the UN agencies in New York. In Washington, the Chief Minister is scheduled to meet the World Bank officials. The meeting is being facilitated by Mr Montek Singh Ahluwalia. Capt Amarinder Singh said that Punjab had not got any assistance from the World Bank in the past five years but his government was now taking steps towards better fiscal management. The Chief Minister is heading a 10-member team which includes Finance Minister Lal Singh, Political Secretary to the Chief Minister Gurmeet Singh Sodhi, Mr Surinder Singla, Chief Secretary Y.S. Ratra, Finance Secretary K.R. Lakhanpal, Principal Secretary to the Chief Minister S.K. Sinha besides two SPs and a DIG. The Chief Minister dismissed allegations of “witch-hunting’’ against Akali Dal leaders in Punjab and asserted that his government was committed to exposing corruption in the state even if the high and mighty were involved in it. “There is no witch-hunting in the state against any one. But we are committed to expose corruption and would act if there is concrete evidence against any one, including the former Chief Minister Parkash Singh Badal,’’ the Chief Minister said. He said charges of excesses were being levelled by the Shiromani Akali Dal against the state government to prevent police probe into cases which could be uncomfortable for them. The Chief Minister asked how persons like Wassan Singh Zaffarwal could enter the country under the Akali rule. Capt Amarinder Singh said his government would continue to expose corruption to restore transparency and probity in public life. “How can they talk about witch-hunting when one of the Akali Dal ministers has been found with assests of Rs 35 crore,’’ he said. On the drought-like situation in Punjab, the Chief Minister said the state government had demanded Rs 800-crore relief from the Centre. He said no district in the state had been declared drought-hit as crop damage was not to the extent of 50 per cent. Former Punjab Medical Education Minister Manoranjan Kalia has strongly condemned the foreign visits of Chief Minister Capt Amarinder Singh, especially at a time, when the state was facing several problems including, power cuts, drought-like situation, agitations, financial crisis, etc. Talking with mediapersons, Mr Kalia alleged that perhaps it was for the first time that the Chief Minister and the Chief-Secretary, along with the Finance Minister were on a joint trip abroad. This is not in the interest of the state, he added. Further, due to infighting in the Congress and lack of trust in Congressman, the Chief Minister did not appoint any acting Chief Minister. Mr Kalia described the anti-corruption compaign launched by the congress government as purely a political one. He alleged that the Congress government had completely ignored its poll promises and development of the state, and was focusing more on its vindictive policies. He said human rights, were also being violated in the state by the government machinery and it was time for the judiciary to intervene. Commenting upon the agitational approach of government employees, Mr Kalia said, the SAD-BJP govt did its best for the welfare of these employees despite an acute financial crisis in the state. If allegations in a writ petition filed before the High Court are to be believed, former minister Nirmal Singh Kahlon’s son, Dr Shiv Karan Singh Kahlon was transferred four times in three months. Taking up his petition, Mr Justice Jawahar Lal Gupta and Mr Justice S.S. Grewal of the High Court have asked the state of Punjab to file an affidavit indicating the reasons behind the issuance of the transfer orders “so frequently”. Pronouncing the orders, the Judges also issued notice of motion to the state and another respondent for August 16. Mr Surinder Singh Kairon, former Congress MP, said today that he was ready to quit politics if the allegations that Mr Parkash Singh Badal, former Chief Minister, had bought a house for his son Adesh Partap Singh Kairon (son-in-law of Mr Badal) at Chandigarh with a view to settling “family feuds.” This was reported “disclosed” by Mr Sucha Singh Langah, former minister, during investigations by the Vigilance Bureau. Mr Kairon said Capt Amarinder Singh should not stoop so low do defame the relatives of Mr Badal with a view to settling “political scores”. He further alleged that it was the Vigilance Bureau which had spread he disinformation about Mr Langah’s disclosure. Mr Kairon claimed that his son bought the house at Chandigarh and withdrawn money from his account which could be checked any time. Moreover, the land deal was evaluated by the central authority. He said if the allegations were proved wrong then Capt Amarinder Singh should quit. “We have been selected on the basis of our outstanding academic and professional record. Enlisting our batch among the tainted ones is great injustice with us”. This is how four Assistant Town Planners (ATPs) of the 1999 batch selected by the PPSC have reacted to the reports that their batch is to be sacked. All four — Mr Pankaj Bawa, Mr Inderjit Singh, Ms Mandeep Kaur and Ms Amandeep Sandhu — have points to prove in their favour. Mr Bawa, Mr Inderjit Singh and Ms Mandeep had stood first, second and third, respectively, in the M.Tech course in 1998. Mr Pankaj Bawa is still a record holder of the university with 74.3 per cent marks in M.Tech. The qualification for recruitment as an ATP was only B.Tech. Mr Bawa was also second in the university in B.Tech. Ms Amardeep Sandhu, fourth on the selection list, was fifth in the university in the B.Tech course. She was topper in dissertation. All four belong to lower middle class families. “Our families did not have enough money to spend even on our studies what to talk of buying jobs for us,” they said. “I took tuitions for eight years to finance my studies,” says Mr Pankaj Bawa. Academic excellence seems to be the main trait in Mr Bawa’s family. He not only topped in M.Tech but his thesis was also declared best in an all-India competition conducted by a jury of very high-grade academicians. Before being selected as an ATP, Mr Bawa worked as a lecturer in GND University, Amritsar, and also worked as Planning Officer in the Town and Country Planning Department. The only brother of five sisters he recently got married. His four sisters have also been gold medalists in their respective academic fields. His father a class III employee. Mr Inderjit Singh, who was second on the selection list, belongs to the family of a small shopkeeper. “For his entire life, my father worked hard to get his three wards settled in life and he expired in April 2001. Many a time, he had not even money to pay our fees what to say of paying a huge sum to secure a job for me,” he said. Mr Inderjit Singh also worked as a lecturer for one and a half years in the university before his selection as an ATP. Moreover, he has been selected in the backward classes category and only two candidates had appeared in the interview in the PPSC from this category. “My academic record was far better than my competitor in this category”, he claimed. Likewise, Ms Mandeep Kaur worked as Manager Planner in the Haryana State Industrial Development Corporation. She had also cleared the UGC examination. My academic record has been excellent throughout. I was selected purely on merit. There was no question of paying a bribe to get the job. Similar views were expressed by Ms Amandeep Sandhu. “Let our academic credentials be thoroughly examined before doing injustice with us. We have records to show to all concerned”, says Ms Sandhu. “We should not be hanged without trial. We should be given a fair chance to explain our position to all concerned,” they say. What has added to their woes is that they have entered a five-year bond with the Punjab Town Planning Department after joining the department in 1999. The bond is worth Rs 5 lakh. “We cannot jump the bond”, they say. Otherwise, if we had not signed the bond, there were a number of other opportunities for us in the past three years to be selected elsewhere. “Many of our juniors with less bright academic records have got jobs in other departments in the past three years,” they assert. As a fallout of the 35 students fleeing the Jawahar Navodaya Vidyalaya at Sandhuan village near Chamkaur Sahib on July 28 night, the Principal of the school, Mr S.S. Bedi, was today placed under suspension by the top authorities of the Navodaya Vidyalaya Samiti. During the suspension period, he has also been transferred to the regional office of the samiti at Shillong in Meghalaya. So, strict were the strictures against the Principal that he was ordered to leave the school premises by evening. The vidyalaya authorities received the orders regarding the suspension and transfer of the Principal today noon through fax. Sources told The Tribune that the Deputy Commissioner, Ropar, Ms Seema Jain, today talked on telephone to the higher authorities of the Navodaya Vidyalaya Samiti in Delhi and reported the “dictatorial” attitude of the Principal towards the students and the mismanagement on his part in the school. Following this, the suspension orders against the Principal were conveyed through fax to the regional authorities who were camping at the school since yesterday. Mr M.L. Sharma, Deputy Director in the Chandigarh regional office of the samiti, who is camping today at the school, talking to The Tribune confirmed the suspension and transfer of the Principal. He said the Principal had been relieved of the charge and directed to leave the school by evening. Besides the Principal, the catering assistant of the school had also been transferred to another school, he added. The sources also said that strict action was taken against the Principal because of the glaring acts of mismanagement on his part. The role of the son of the Principal, who studied in the 12th standard in the same school, also attracted the ire of authorities. It was alleged that the son of the Principal used to harass fellow students. He was also spotted by the district administration officers trying to cover up the tracks for the alleged mismanagement of his father. The students who fled the school also later alleged that the son of the Principal used to bully them. Meanwhile, the Deputy Commissioner today held a press conference to reveal the findings of the magisterial inquiry conducted by the Ropar SDM, Mr Daljit Singh, into the reasons for the fleeing of students. Talking to the mediapersons, Ms Jain told the inquiry had indicted the management of the school for providing inadequate and poor quality of food to the students of this residential school. Despite the fact that the school used to receive more than sufficient funds (Rs 555 for each student per month) for food, both quality and quantity were found to be below standard. To fix the responsibility for that in her capacity as the chairperson of the school, she had ordered a separate inquiry regarding misappropriation of funds, she said. She also stated that changes were also being made in the procurement of food and other items for the school. Earlier a single tender was floated for all commodities but now different materials would be procured through different tenders. The inquiry report has also lamented the deplorable sanitary and health amenities in the school. It has been recommended that in view of the poor health of the students, the public health authorities should be ordered to visit the school at regular intervals. The administration has also decided to have regular interaction with the students to know their grievances and redress the same. It has also been decided to involve the Sarpanch of the village in the management of the school to keep a close liaison with the students and school authorities. Nearly 2,000 members of the Punjab Co-operative Gazetted Officers’ Association today took mass casual leave in protest against the government action against department officers and expressed solidarity with the Additional Registrar, Mr Parmeshwar Singh Sidhu, against whom the Vigilance Bureau has registered an FIR. The officers first held a rally at Kharar and later met at Kisan Bhavan, where the following resolutions were passed. The association condemned the government action and demanded immediate quashing of the FIR against Mr Sidhu. It appreciated the stand of Parliamentary Secretary Gurbinder Singh Atwal, who looks after Co-operation, and other officers of the department in supporting their cause and asked the Chief Minister to order withdrawal of the FIR. The association has formed an action committee to chalk out the next course of action. It also met the Financial Commissioner, Co-operation, and the Registrar. It is learnt that the loaning facility at the level of the primary agricultural service societies would be stopped with effect from Monday if the FIR was not quashed. The societies disburse nearly Rs 1,000 crore, annually. Association leaders said banks disbursed loans after proper verification of the documents. The recovery was effected from the defaulters, not Managing Directors. Punwire was given money on instructions from the department of finance. ‘’There are crores of rupees outstanding against PFC and PSIDC defaulters. How come no IAS officer, who served as Managing Director, has been arrested the way Mr Sidhu was? Several other government departments and agencies had given crores to Punwire, how come no action has been taken in their cases,” they asked. The association disclosed that following a meeting with Chief Minister Amarinder Singh on Monday, instructions were issued to the Vigilance Bureau to submit a factual report and not to proceed ahead with more arrests. ‘’But tangible results are awaited,” the officers added. In a memorandum to Giani Joginder Singh Vedanti, Jathedar, Akal Takht, Dr Jagjit Singh Chohan, president of the newly formed Khalsa Raj Party, today urged him to issue a hukmnama to ensure “compulsory retirement” of Mr Parkash Singh Badal and Mr Gurcharan Singh Tohra from politics. He alleged that the duo had caused immense damage to the Sikh Panth. Dr Chohan alleged that after Master Tara Singh, Sant Fateh Singh, Sant Channan Singh, Jathedar Mohan Singh Tur, Jathedar Jagdev Singh Talwandi, Sant Harchand Singh Longowal, Mr Surjit Singh Barnala, and Mr Tohra emerged as leaders but they added ‘woes’ to the already ‘injured psyche’ of the Sikhs from time to time. “They had failed to come upto the expectations of the Sikh masses”, he alleged. He said there was need to amend the pronouncement of ‘tankhah’ (religious punishment) as the prevalent system had not brought the desired change in the attitude and approach of the persons/leaders who underwent such punishment in the past. The memorandum said that earlier he was supporting the idea of summoning Mr Tohra and Mr Badal to Akal Takht for their alleged role in violating the Sikh maryada. However, he said with the passage of time, the Khalsa Raj Party felt that it was not enough. “Their retirement from active politics would bring the desired changes”, he said. Dr Chohan said the long standing issues of the state were still unresolved as the ‘discarded’ Akali leadership could not pursue them in the right perspective. To a question, Dr Chohan replied that his party would contest the forthcoming general elections of the SGPC. He sought action against Mr Badal who had allegedly amassed huge property, disproportionate to his known sources of income. He justified the interrogation of Mr Sucha Singh Langah, a former Akali minister, and claimed that he was not tortured as alleged by the Akali Dal. He said corrupt persons must be brought to book at all costs. To avert a possible clash between an SGPC team and Nurmehalias, the administration clamped down on a function organised by controversial Mahant Ashutosh Noormehalia on getting reports that an SGPC team was heading for Dhand village to effect the closure of the function. 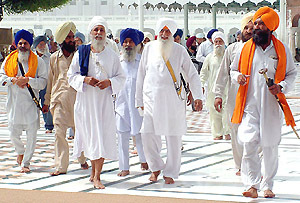 The SGPC team was led by its senior member Jaswinder Singh Advocate. However, the SGPC team after reaching the village called a meeting of the gurdwara head, secretary, members and local population and criticised Nurmehalias. Mr Jaswinder Singh said the village residents promised that no Nurmehalia would be allowed to preach or hold a function there. Meanwhile, Akal Purkh di Fauj activists, including its coordinator Jaswinder Singh, criticised and also took strong notice of the incident at Malout in which several Sikh activists were injured in police firing and lathi charge yesterday. In a press note it criticised the activities of the Nurmehalias, especially of Mahant Ashutosh, who had created an unsavoury atmosphere following his controversial utterances against the Sikh Gurus and Sikh religion. The spokesman of the fauj stated that Sikhs were anguished by the government’s complacent attitude towards those who were trying to vitiate the religious atmosphere in the state. Mr Shashi Kant Bansal, a local resident, has alleged that the PUDA authorities were not transferring the ownership of a plot to his and his wife’s name although they were the legal claimants after the death of his father. In a letter to the Deputy Commissioner, Mr Bansal said his father died on January 2, 1996. According to his father’s will after his death his son and daughter-in-law would be the owner of a plot in the Urban Estate. When Mr Bansal went to the PUDA authorities in 1998 to get the plot transferred the authorities raised objections to his claim. He completed the formalities regarding the objections. However, on July 18 the authorities told him that he would have to pay few instalments, which were due since 1972. The local PUDA authorities, when contacted, said the ownership of the plot would be transferred to Mr Bansal and his wife in a few days. They said as proper receipts of payments were not available with the persons concerned it was suspected that the some payments might not have been paid. A Division Bench of the Punjab and Haryana High Court, comprising Mr Justice G. S. Singhvi and Mr Justice Kiran Anand Lall, today directed the state of Punjab to constitute a team consisting of one Deputy Director and two Senior Assistant Directors of primary education to make a proper inquiry into the fake degree recruitment scam. This order was passed by the Bench on a PIL filed by advocate Kapil Kakkar. In his petition, he had sought directions for a thorough probe into the alleged illegal appointments made in the Punjab Education Department on the basis of fake degrees as reported in The Tribune. Earlier, during the course of hearing it was brought to the court’s notice that the department to some extent had verified the degrees of certain candidates and had found them to be fake. It was observed by the Bench that in its opinion method deputed by the government for verification of the degrees was not satisfactory and there was likelihood that the information received from the university may not be correct. Directing the constitution of the committee, the Bench further ordered that the committee would visit all the places from where the degree had been procured and shall make investigation to find out the genuineness of the investigations from where the degrees were said to have been awarded. The Bench made it clear that this would necessarily mean an inquiry into the character of the institution that whether the university was established by law or was a deemed university or a private body. The Bench also directed that the committee would look into the genuineness of the degree and shall conform that whether this was issued by said university or institution or not and the report prepared by the committee be filed in the court within 10 weeks. It was contended by Mr Kakkar that the manner in which the appointments had been made was a fraud committed on thousands of eligible persons who had been deprived of consideration for the posts which the respondents had “distributed” as their private property and all rules and regulations had been ignored. The latest strategy of the Punjab Government seems to be to buy time by constituting sub-committees to discuss various issues related to state employees — privatisation, retrenchment of workers and to cut their allowances. The state-wide agitation led by the mahasangh of state boards, cooperatives and corporations and boards and federation of employees have been won over by that strategy. Mr Tej Parkash Singh, Transport Minister, also succeeded to convince Punjab Roadways employees here today, to postpone their strike called for tomorrow, without yielding anything at all. The Joint Action Committee of Punjab Roadways Employees Unions had given a call for state-wide strike tomorrow, to protest against the government’s move to privatise the transport sector, and to seek the addition of about 1100 buses to the roadways fleet, besides other demands. We have been forced to postpone our strike, said a union leader, as half of our buses have already left for other stations, and the workers could not be informed about the non-acceptance of any demand. The union leaders argued that the state government had not made any payments for the free travelling service provided to various categories, worth Rs 245 crore for past five years, as per government instructions. The Punjab State Electricity Board (PSEB) Engineers Association yesterday sent an SOS fax to the State Regulatory Commission for financial relief to the Board from April last. Releasing a copy of the message, Association senior leader Padamjit Singh said the Board was on the verge of total collapse and that this was bound to reflect upon the coal and power purchases from the Centre. He said presently all thermal units — Ropar, Bathinda and Lehra Mohabbat — were running to full capacity and generating 490 lakh units per day against the total consumption of 1050 lakh units per day. The daily coal consumption was for Rs 7 crore. The Board was purchasing power for Rs 4 to Rs 5 crore daily from Central agencies. It said besides the debt servicing of institutional loans was estimated at around Rs 5 crore per day. Mr Padamjit said the total expenditure on these three sectors was around Rs 18 crore per day, where as the revenue at the existing level of tariff was just Rs 13 crore per day. Thus it said even if the wages bill was made zero the Board would still be in a deficit of Rs 5 crore per day. He said the Board was also losing a revenue of around Rs 4 crore per day on account of diversion of power to tubewells from the commercial sector. The SOS said the tariff petition of the Board was pending before the Regulatory Commission since April 4. The normal period for deciding such a petition was 90 days. It appealed to the Commission to implement the decision of the Punjab and Haryana High Court by complying with Section 59 of the Electricity (Supply) Act, 1948 under which the Board had to ensure a surplus of 3 per cent every year. Mr Amarjeet Singh Samra, Agriculture Minister, Punjab, accompanied by Dr Mohinder Kumar Rinwa, local MLA and Parliamentary Secretary, Punjab, toured border villages of the subdivision yesterday to access the drought situation. At Kabulshah Hithar village some horticulturists, whose orchards had been taken over by the Army or where landmines had been laid, demanded extra compensation by getting the value of the yield assessed. Later, while addressing the press conference here Mr Samra stated that the second instalment of the compensation i.e. Rs 6,590 per acre to farmers whose land had come under mine fields would be distributed from August 5. The disputed claims would also be settled soon. He further said the special girdawari of drought-hit areas where crops had been ruined would conducted from August 10.Besides, the affected farmers would be offered Rs 700 per acre as relief intended to sow other crops, the minister added. In reply to a question the minister said the SDM has been directed to identify the areas which could not be irrigated due to the diversion of canal water. The Agriculture Minister said the government proposes to provide gypsum within one month to retrieve kallar land to enable it to be utilised for agriculture purposes. Mr Samra said the raids in the Revenue Department to check corruption would continue and claimed that 70 per cent of corruption in his department had been checked. He further said the government had no proposal to wind up the newly created sub-tehsils by the Badal regime. However, exceptional cases might be reviewed, he added. The district administration today set up control rooms at the district level and the subdivisional level to ensure enough water for paddy. Stating this here today, the Deputy Commissioner, said the District Revenue Officer had been appointed nodal officer at the district level and would send daily reports to the government. At the subdivisional level, the SDMs would hold daily meetings with officers of the Agriculture and Animal Husbandry Departments and the PSEB so to redress the problems of farmers. Revenue staff had also been put on alert and would monitor the situation on a daily basis. Girdawari would be undertaken only after receiving orders from the government, he added. Punjab Lokpal D.V. Sehgal has said that there is a definite case to start an inquiry under Section 13(1) of the Punjab Lokpal Act against former Rural Development Minister Nirmal Singh Kahlon. A complaint against Mr Kahlon was filed by Mr Manjit Singh, a resident of Dadu Jodh village. It was alleged that following his (Kahlon) orders, and with the recommendation of the Collector, the panchayat of Dadu Jodh village sold 2 kanal and 2 marlas of land to Mr Kahlon’s sons and nephew. Justice Sehgal had got the complaint verified from his Inspector-General of Police. The Amritsar district administration has lifted the ban on the use of Rs 1.35 crore issued to the local Municipal Council by the previous Punjab government under the sangat darshan programme launched by the then Chief Minister. Sources said here yesterday that a grant of Rs 1.50 crore was issued to the Municipal Council of which the council had used Rs 15 lakh for different development works. However, after Capt Amarinder Singh took over as Chief Minister. The Chief Secretary, issued a letter imposing a ban on the use on the remaining grant, resulting in all development works coming to a standstill. The local Government Rajindra Hospital, attached to Government Medical College here, has been without X-ray films for the past five days causing inconvenience to hundreds of people who visit it everyday. Accident victims are the worst hit as they are medico-legal cases and hence cannot be referred to private X-ray centres. Their X-ray examinations are delayed for hours. Doctors at the hospital said they had started referring the medico-legal cases to the office of the Civil Surgeon so that they could get their X-ray examinations done. They said this led to the wastage of time and the patient had to be taken to and brought back from a government hospital in the city. They said relatives of the patients had to take the initiative themselves and there was no ambulance that could be put to the service of such patients. Sources said while patients with minor injuries still managed to go through the process, those with major fractures had to pass through hall while being transported to another hospital. Besides medico-legal cases, patients referred to the hospital by various courts on one count or the other also have to wait for the test. The patients admitted to the hospital who have to undergo X-ray examination as part of investigations, will also have to wait for their turn till the films arrive. The doctor said the Radiology Department had warned the hospital authorities about the depletion of its stock of films around three months ago and asked that it be replenished quickly. They said last week the hospital had borrowed X-ray films from the government hospital at Faridkot for urgent cases but that stock had also been exhausted. The Radiology Department also asked the authorities to procure films on an emergency basis by making use of contingency funds. However, as this was also not done the hospital is doing without X-ray films for the past five days. Doctors attending to patients in the Radiology Department said they could not ask patients to get their own films as these were sold in a bunch. The Medical Superintendent of the hospital said an order for the films had already been placed a month ago and that these were expected soon. Sources, however, claimed that the firm which was to supply the films, was insisting on payment of earlier bills before it supplied the fresh order. The Medical Superintendent, however, said this was a fresh order and was not related to earlier orders. Residents are livid at the situation. Mr Charanjit Singh a resident of Sheranwala Gate, says the fact that the hospital has been turning away patients because it does not have X-ray films is shocking. He said X-ray films were a basic necessity and that such a situation spoke of the sorry state of medical institutions. Coming down heavily on the plying of illegal private buses, the Transport Department authorities yesterday impounded 12 tourist buses, as part of a special checking drive initiated last week. The buses were impounded during a naka laid by the District Transport Officer, Mr Vinay Bublani, on the Jalandhar-Amritsar Highway this afternoon. Most of buses were plying between Amritsar and Delhi on a tourist permit, violating all norms, which specify that such buses could only be used for carrying tourists and not passengers. By using tourist buses for ferrying passengers, unscrupulous operators, were saving passenger tax to the tune of Rs 3200 per day, causing huge losses to the state transport department. When contacted, Mr Bublani said it was for the first time that such buses were impounded as earlier violators were allowed to take away their buses after they had deposited the requisite penalty. Mr Sharanjit Singh Dhillon, president of the Youth Akali Dal, said on Tuesday that the state unit of the youth wing would be constituted within a fortnight. Talking to newspersons here, Mr Dhillon said the district and block units would be constituted thereafter. Stating that democratic rights were being “trampled” upon by the state government, he alleged that Akali workers were stopped today from going to Kharar and many were detained illegally in police stations in various parts of the state. These workers wanted to express solidarity with former Akali minister Sucha Singh Langah who was to be presented in a court at Kharar. He urged the Punjab Human Rights Commission to take cognisance of such “violations”. Mr Roshan Lal Chouhan, Judicial Magistrate, Kharar today remanded Parmeshwar Singh, former Managing Director of Punjab State Cooperative Bank, into police custody till August 3 and ordered that the accused be given all medical facilities during this period. Mr Jatinderjit Singh Punn, public prosecutor and Mr Inder Mohan Singh, SP, Vigilance appeared in the court and pleaded for a five-day police remand of the accused. Mr Punn said that the accused had a bungalow worth about Rs 40 lakh in Bhutcho Mandi and a shopping complex in Bathinda. He said information about these properties and some other properties was yet to be collected from the accused. Despite the clouds playing hide and seek in the sky without delivering rain, today was probably one of the toughest day for local residents with unscheduled power cuts stretching up to eight hours. Still worse was the plight of residents of Kharar where according to one source electricity supply at many places was barely for two hours since morning. According to electricity board officials, orders for power supply cuts were being received from Patiala and since these were short notice messages it was not possible to schedule these or inform residents. Devotees of Panjpeer Mazaars, who travelled from Jalandhar, Ludhiana, Nawanshahr, Moga, Bathinda and neighbouring towns of Rajasthan and Haryana to pay their obeisance had to wait for hours in the queue to pay their obeisance at the annual ‘urs’ (fair) here yesterday. The Punjab Government has suspended Jaspal Singh Randhawa, Excise and Taxation Officer, Faridkot, following the receipt of a serious complaint against him, a spokesman of the government said. The police has arrested Puran Singh, Manager, State Bank of Patiala, Narot Jaimal Singh; Darshan Singh, a resident of Seunti near Narot Jaimal Singh; Ajit Singh and Kuljit Kaur both residents of Gurdaspur for fraud. Their accomplices, including Ajit Kumar Patwari, a resident of Tharyal in police station Shahpur Kandi, Karan Singh Numberdar, Narot Jaimal Singh; Dara Singh, a resident of Gurdaspur and Crore Singh, a registry clerk in sub-tehsil Narot Jaimal Singh are at large. Gurmail Singh, Naib Tehsildar, Narot Jaimal Singh, who was also a conspirator in a case of forgery has expired. The SSP, Mr Varinder Kumar, said today that a case under Sections 419/420/467/468/471 and 120-B of the IPC has been registered against the accused. Giving details, the district police chief said Charanjit Kaur who owned 30 acres of land in Seunti village had given the jamabandi of this land to Dara Singh in 1991. Dara Singh, who was working as a salesman in Paul Auto Agency, had promised to help her get tractor loan. But he could not manage the bank loan. He asked her to take back her jamabandi, which she did not. The police has arrested Arun Kumar, owner of R.K. Light and Music Shop, and Raj Kumar, owner of R.R. Electronics, both of Pathankot, while Sanjay Puri, owner of Om Video Gallery, Pathankot, escaped for their alleged involvement in preparing video/CD cassettes of proscribed films. The accused were also involved in the sale of pirated cassettes at cheaper rates. Mr Varinder Kumar, SSP, said today that the Pathankot police on a tip-off raided the said shops and recovered 1500 duplicate video cassettes of films and 400 blank video cassettes. Balkar Singh, a local resident, allegedly murdered his wife Rani last night when she objected to his taking liquor in excess. His brother Jeet Singh was also alleged to be involved in the crime. As per information, Balkar Singh with the help of his brother strangled Rani with a leather strap. In order to hide the crime Balkar Singh hanged her from the ceiling of his house and told the members of family that she had committed suicide. However, the authorities concerned said Rani died before she was hanged. The family of Rani said Balkar used to take liquor in excess to which she objected, which led to brawls in the house everyday. They added that Balkar used to beat her. A case under Section 302, 34, IPC, has been registered. Both of them have absconded. The police has booked three persons engaged in extorting huge sums on the pretext of sending youths to Greece for employment. Mr Varinder Kumar, SSP, told newsmen here yesterday said that the police yesterday booked Baldev Singh, his wife and relative Kishan Singh under sections 420, 336 and 337, IPC, in police station division no 1, Pathankot. The district police chief said Vijay Singh of Mukerian on Tuesday lodged a complaint that Baldev Singh, alias Booti of Gandhi chowk, Pathankot promised him to send his son to Greece. The Principal of the local Khalsa College, Dr M.S. Dhillon, has sought probe into the amassing of assets disproportionate to his known sources of income by Prof Baljinder Singh and his links with the Babbar Khalsa. The Principal in a letter to the Director-General of Police, Mr M.S. Bhullar, has alleged that Prof Baljinder Singh was one of the key members of the Babbar Khalsa during the peak of militancy and was arrested under the National Security Act (NSA) on January 16, 1985 and remained under detention till September that year. He was again arrested in 1991 under the NSA for unlawful and subversive activities and remained in jail for over two years. Dr Dhillon alleged that the professor had amassed huge wealth during the most troubled times in the state. The professor besides indulging in unlawful and anti-national activities played bully in the college and a thrashed his colleague from the Department of Commerce and submitted a written apology for his act, the Principal said. He added that the professor had the habit of losing temper and had even slapped the then under secretary of the college managing committee. He said the professor even coerced students to join his coaching academy with the temptation that maximum marks would be awarded to them during the internal assessment. Based on the complaint from the residents of the locality where he ran his academy which he had to close down in view of the protest, the managing committee of the college had stopped his increment for one year during 1999 for his professional misconduct and violating the guidelines of Guru Nanak Dev University for wrongly awarding internal assessment marks to students of the MCBA part-II. The college barred him from taking postgraduate classes because he was forcing the students to take tuition from him. The Punjab School Education Board (PSEB) Vice-Chairman Gurdev Singh Sidhu, a co-accused along with former Education Minister Tota Singh in several criminal and corruption cases, was removed from his post this evening. Dr Narpinder Singh, Professor of Food, Science and Technology, was declared President of Guru Nanak Dev University Teachers Association (GNDUTA) here on Tuesday. He polled 178 votes while his rival Dr H.S. Sidhu, Professor of Punjab School of Economics, got 115 votes. Dr Vikram Chadha of Punjab School of Economics was elected vice-president by polling 158 votes. He defeated Dr Jaswinder Kaur Dhillon of Guru Nanak Studies, who polled 129 votes. Dr Parminder Singh of the English Department was elected unopposed as the secretary. The office of the joint secretary went to Dr Adarsh Pal Vig, Department of Botanical and Environmental Sciences, while Dr Bikramjit Singh Sekhon, Guru Ram Dass School of Planning, was elected as the treasurer. The executive members of the association are Dr Davinder Singh, Psycology Department, Dr Amarjit Singh Sidhu, Commerce and Business Management; Dr Sharanjit Singh Dhillon, Punjab School of Economics; Dr C.S. Cheema, Commerce and Business Management; Dr Jagrup Singh Sekhon, Political Science Department; Mr Balwinder Singh, Guru Ram Das School of Planning. The election was held under the overall supervision of Dr Bikram Singh Ghuman, Dean Academic affairs of the University.